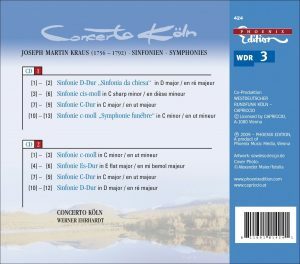 I was sent back to this and other recordings of Concerto Köln by my recent listening and reviewing of three symphonies of Anton Eberl performed by the ensemble on Teldec 6 3984-22167-2 2. Eberl is a particularly interesting and significant case, since his Symphony in E-flat major op. 33 was premiered at the same 1805 concert at the Theatre an der Wien that saw Beethoven conduct the first performance of his own Symphony (not yet known as) “Eroica” – and many critics prefered Eberl’s composition. Not that you should expect for a second that they were right: it only shows that it is always easier to recognize what one already knows, rather than true novelty. Eberl was more in the league of all those now almost forgotten late 18th and early 19th century composers, thrown back to near oblivion by the genius of Mozart, Haydn and Beethoven, whose resurrection Concerto Köln has made something of a specialty of: the Bach sons (Capriccio 10 283, barcode 4006408102830), Kozeluch (Teldec 8573-85495-2), Rosetti (vol. 1 Teldec 7 4509-98420-2 4, vol. 2 Teldec 7 0630-18301-2 3), Vanhal (Teldec 7 0630-13141-2 8), Myslivecek (“Il Divino Boemo”, Archiv Produktion 477 6418, barcode 028947764182), Rigel (Berlin Classics 0016432BC, barcode 782124164324), Wilms (Archiv Produktion 474 508-2 barcode 028947450825), Gossec (Capriccio 67 073, barcode 4006408670735), Stamitz and Cannabich (“Mannheim: The Golden Age (Works by Christian Cannabich, Carl Stamitz, Anton Fils, Johann Stamitz, Ignaz Fränzl, Teldec 6 3984-28366-2 3) – the list is not limitative. 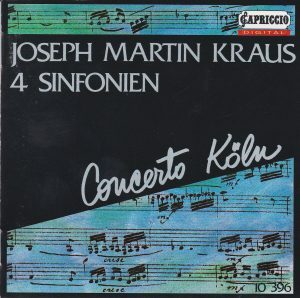 Joseph Martin Kraus is one of those. 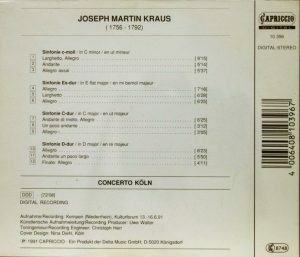 Kraus’ dates (1756-1792) make him an exact contemporary of Mozart, integral with the untimely death at the age of 36, one year and ten days after Mozart (he was his younger by a mere five months). He was born and trained in Germany but established in Sweden at age 21 (incidentally, German-born Beethoven established in Vienna at the same age). 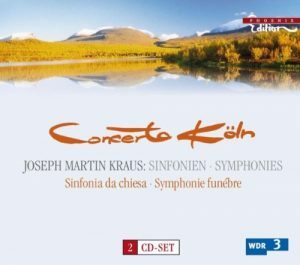 The four symphonies gathered on this CD were composed in the first half of the 1780s: this is when Mozart composed his Haeffner Symphony (No. 35), and the prolific Haydn his 73 to 81. At his not so inspired (usually in the middle movements), Kraus very much partakes of a “galant” style that plumbs no depth. Pretty but inconsequential, although even there, there are darker moments that are quite taking (as at 3:13 in the “Andante” of the C-minor Symphony from 1782, track 2). At his best (which is more frequent), he is, to my ears, as enjoyable as Mozart and Haydn. The slow introduction to that same symphony (track 1) unfolds great drama – this is as powerful as Mozart’s Requiem – and likewise the following allegro again develops great power and “sturm and drang” agitation – a feature that pervades the outer movements of his symphonies, with great dynamic jumps and ebullient outbursts, even when the mood is lighter-hearted, as in the first movement of the Symphony in C-major from 1781 (track 7) or the finales of the Symphony in E-flat major from 1784 (track 6) and the Symphony in C-major (track 9). The slow movement of that same Symphony (track 5) has a plangent and somber mood that vaguely hints to the Adagios of Beethoven’s first two symphonies. The Symphony in D-major from 1784 is uniquely ebullient and I can’t imagine any amateur of Mozart and Haydn remaining cold to it. I personally don’t hear any difference in artistic value. I haven’t yet heard the more recent recordings by the Swedish Chamber Orchestra under Petter Sundqvist on Naxos.